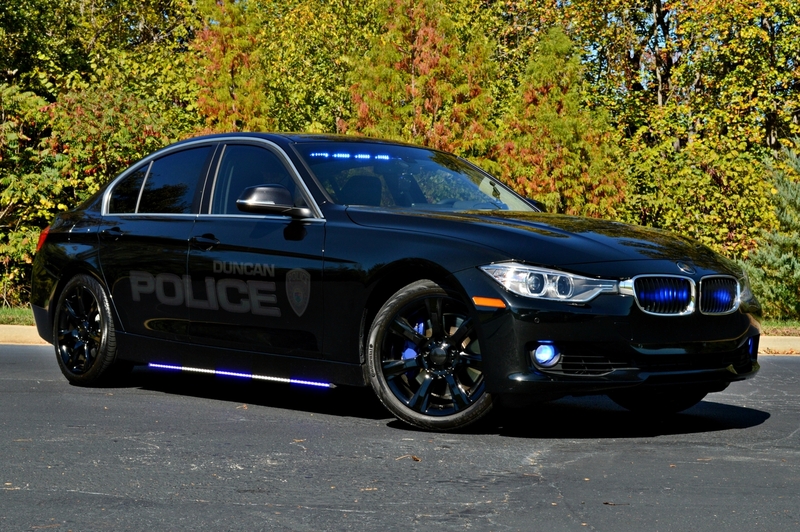 2015 BMW 335i - New Decals "Ghost Graphics"
(Duncan, S.C.) – 4/9/17 – The Duncan Police Department is currently evaluating the BMW 335i as its next generation patrol vehicle. The agency, located in the Spartanburg County portion of the state, currently relies on the Chevrolet Caprice and Chevrolet Tahoe as its mainline patrol vehicles. With General Motors recently announcing its plans to phase out the Chevrolet Caprice from its Police Pursuit Vehicle (PPV) lineup, the Duncan Police Department like many agencies has been forced to scramble to find a replacement. Though not a very common practice in the United States, the BMW has long been the vehicle of choice for law enforcement agencies around the world. Under the current South Carolina Vehicle Procurement contract, the Chevrolet Caprice tops out as one of the most expensive cruisers available for purchase. With the assistance of the local BMW dealership, the Duncan Police Department has been able to acquire a pair of BMW 335i sedans at a considerable cost savings when compared to the current price of the Chevrolet Caprice PPV. The BMW 335i boasts 300HP and over 300lbs of torque putting it inline with current PPV’s on the market. Over the next several months, the agency will be putting the newly acquired cruisers through their paces as traffic and mainline patrol vehicles in order to determine their feasibility prior to their next fleet renewal. Both cruisers currently feature a sleek “Ghosted” graphics package to help them blend into traffic. After all, To view more pictures of the BMW 335i, please click here to visit the Spartanburg County portion of the database.